After walking around your home and taking a close look at your gutters, you may be thinking that it’s time to start with a fresh system. However, depending on the level of damage that your gutters have suffered, gutter repair may be the better option. After all, gutters can last for decades when maintained. 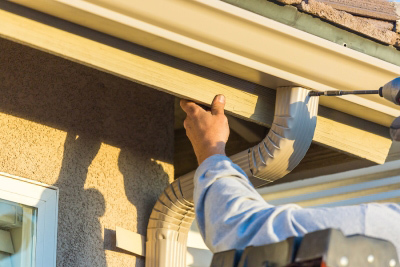 If you see just a few bad areas in your rain gutters, then consider having them repaired. On the other hand, if you can spot several or more damaged spots, then replacement may be the better investment. Some of the issues to look for include cracks, sagging, and signs of water damage. If you’re not sure which route to take, then consider getting an estimate for both services before making a decision. Gutters are available in a wide range of materials, each of which has associated benefits and its own cost range. Among the most widely-used gutter materials are aluminum, copper, steel, and vinyl. Of these, aluminum is the most popular thanks to qualities like its rust-resistance, affordability, and durability. Also, the gutter material that you choose will impact your color options. Aluminum, for example, can be painted, which allows for a wide range of color options, while vinyl gutters may come in fewer colors for you to choose from. Another factor to consider when thinking about new gutter installation is gutter guards and their benefits. Gutter guards are systems designed to keep leaves and other debris out of gutters, which can prevent clogs and help keep gutters clean and functioning well. For this reason, installing gutter guards along with your new gutter system may be a wise decision.